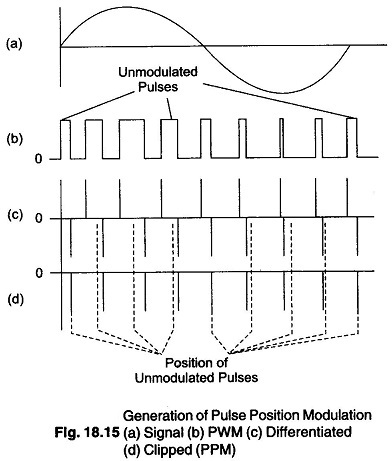 In this Pulse Position Modulation system, the amplitude and width of pulses is kept constant, while the position of each pulse, in relation to the position of a recurrent reference pulse, is varied by each instantaneous sampled value of the modulating wave. PPM may be obtained very simply from PWM, as shown in Fig. 18.15. Considering PWM and its generation again, it is seen that each pulse has a leading edge and a trailing edge. However, in PWM the locations of the leading edges are fixed while those of the trailing edges are not. Their position depends on pulse width, which is determined by the signal amplitude at that instant. Hence, it can be said, that the trailing edges of PWM pulses are, in fact, position modulated. Figure 18.15 shows PWM corresponding to a given signal. If the train of pulse thus obtained is differentiated, another pulse train results. This has positive narrow pulses corresponding to the leading edges and negative going pulses corresponding to trailing edges. If the position corresponding to the trailing edge of an unmodulated pulse (an unmodulated PWM pulse is one that is obtained when the instantaneous signal value is zero) is counted as zero displacement, then the other trailing edges arrive earlier or later. They therefore have a time displacement other than 0. This time displacement is proportional to the instantaneous value of the signal voltage. The different pulses corresponding to the leading edges are removed with a diode clipper or rectifier and the remaining pulses shown in Fig. 18.15(d) are position modulated. When the PPM is demodulated in the receiver, it is again first converted into PWM with a F/F or bistable multivibrator. (One input of the multivibrator receives trigger pulses from a local generator which is synchronised by the trigger pulses received from the transmitter, and these triggers are used to switch OFF one of the stages of F/F.) The PPM pulses are fed to the other base of the F/F, and switch that stage ON (by switching the other one OFF). The period of time during which this particular stage is OFF depends on the time difference between the two triggers, so that the resulting pulse has a width that depends on the time displacement of each individual PPM pulse. The resulting PWM pulse train is then demodulated. (PPM has the advantage of requiring constant transmitted power output, but has the disadvantage of depending on transmitter-receiver synchronism. PWM has a disadvantage, when compared to pulse position modulation, in that its pulses are of varying power width and therefore of varying power content. This means that the transmitter must be powerful enough to handle pulses of maximum width (although the average power transmitted is only half the peak power).